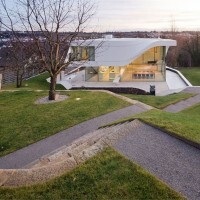 UNStudio have completed the Haus am Weinberg in the suburbs of Stuttgart, Germany. 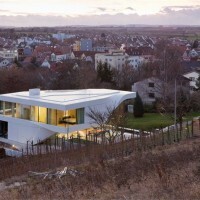 The Haus am Weinberg is located in a setting that is at one time rural, yet suburban. The location of the villa affords pastoral views of the stepped terraces of an ancient hillside vineyard on one side and cityscape vistas on the other. The inner circulation, organisation of the views and the programme distribution of the house are determined by a single gesture, ‘the twist’. 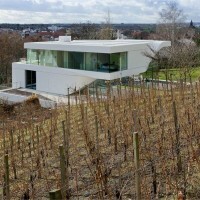 In the Haus am Weinberg the central twist element supports the main staircase as it guides and organises the main flows through the house. The direction of each curve is determined by a set of diagonal movements. Whilst the programme distribution follows the path of the sun, each evolution in the twist leads to moments in which views to the outside become an integral experience of the interior. 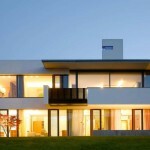 This is enabled by the building’s load bearing concrete structure which is reduced to a minimum. 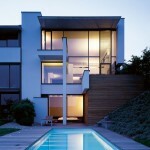 Roof and slabs are supported by four elements only: elevator shaft, two pillars and one inner column. Through the large cantilever spans, a space is created which enables all four corners of the house to be glazed and column-free. 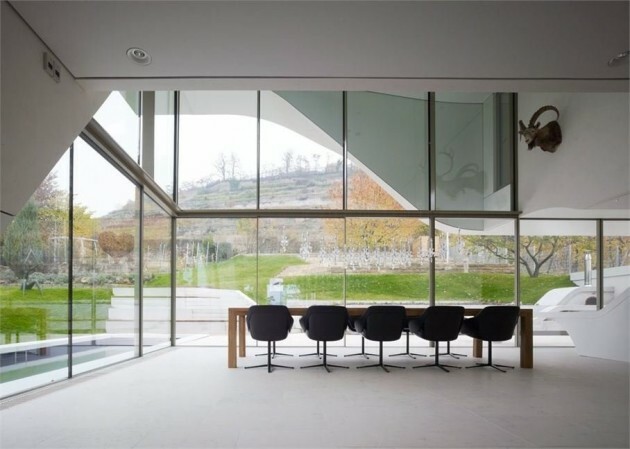 A double-height, glazed corner – which houses the dining area – opens up to extensive views towards the North-West and frames the vineyard hill which forms the backdrop to the house. By means of sliding panes, this corner of the house can fully open up to further blur the boundaries between inside and outside. Views from the living room are extended by means of a fully glazed corner affording open vistas toward the nearby parklands to the South-West. 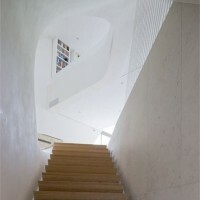 Further views from the twist are encountered on the second level, where the master sleeping and wellness areas are located. 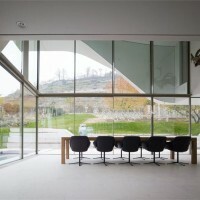 The interior of the Haus am Weinberg is arranged into spaces of varying atmospheres and spatial qualities, with the four glazed and open corners allowing daylight to reach deep into the house. The materialisation of the interior of the house further accentuates the overall atmosphere of light by means of natural oak flooring, natural stone and white clay stucco walls speckled with small fragments of reflective stone. Custom made features and furnishings are also integrated to blend with and accentuate the architecture. 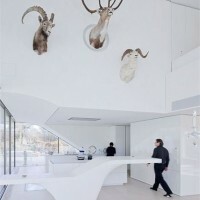 In contrast, at the core of this light and flowing structure is a multi-purpose darker room, dedicated to music, masculine conviviality, and the hunt. In this room the ceilings and walls have especially designed acoustic dark wood panels which transform from an articulated relief on the ceiling into a linear pattern as they descend the walls and meet the dark wooden floors. 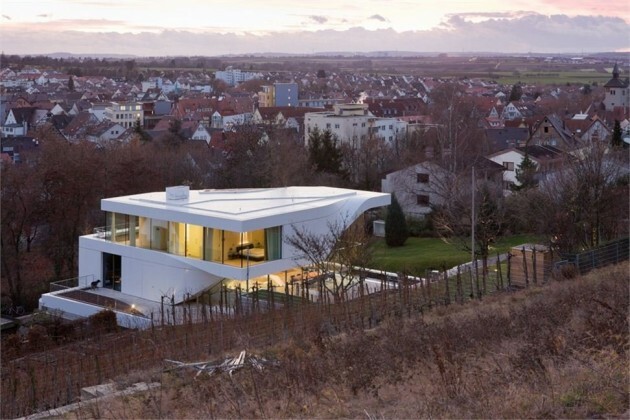 The volume and roofline of the Haus am Weinberg react and respond directly to the sloping landscape of the site, where the scales and inclinations of the slopes which sculpture the vineyard setting are reflected in the volumetric appearance of the house. 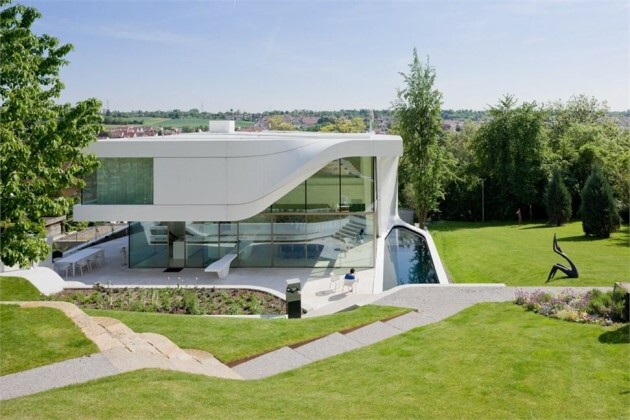 The design of the garden landscaping extends the organisation of the house, with the garden forming a continuation of the diagonals of the floor plans and each division creating different zones for function and planting.